Also referred to as 'the desert in the Sky' the mesmerizing village of Hunder is perched as an oasis surrounded by cold desert and stark Himalayas in Nubra Valley in Ladakh. The village shot to fame after some of the scenes of a song sequence of super hit Bollywood movie of Maniratnam's Dil Se featuring Manisha Koirala and Shahrukh Khan was shot here. Located 150 kilometers North of Leh, Hunder, sitting at an average altitude of 10, 000 feet, is a small village where the Shyok River meets Nubra River. Hunder lies on the ancient silk route, once an important international trade route. 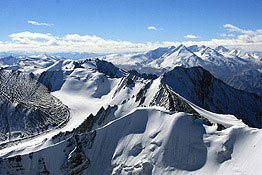 Today it is one of the most strategic points located close as it is to the Siachen Glacier, the world highest battle ground between India and Pakistan. A trip to Hunder from Leh requires the visitors to cross the Khardung La, which according to the claim of Indian Army plaque at the top, is "World's Highest Motorable Pass" however modern readings using GPS devices refute the claim. From Khardung La it's a 130 kilometer of rough drive to reach Hunder Village. Hunder is most popular for the camel rides in the high altitude cold desert. The camel safaris are done on Bactrian Double-humped Camels which are reminder the bygone era of Silk Route trade. The vast stretch of sand dunes between Hunder Village and Diskit is where you will see the Bactrian Camels grazing in the sea-buckthorn forests. It is also where most of the safari rides are offered. Earlier, Hunder Village was the last point where visitors were allowed after obtaining inner line permits from DC office in Leh. Since 2010, the Indians were allowed to travel further to Turtuk. In 2013 even foreigners were allowed to travel up to Turtuk. From 2014, Indian visitors no longer require inner line permits to travel Nubra Valley anymore. Foreign visitors still need to get inner line permits to travel to Hunder in Nubra Valley. Traveling to Hunder and other tourist places in Nubra Valley before traveling to Pangong Lake and Tso Moriri is also advisable as it helps visitors to acclimatize to high altitude air pressure condition. Travel beyond Hunder and toward Turtuk takes visitors to quite different landscape which is unseen in rest of Ladakh. In the colder month of December till March, the entire Nubra Valley is gripped in extreme cold. However day temperatures are bearable for travel and other activities. The issue during this time of the year is accommodation and even more so the food and eating options. Guest houses, hotels and camps are mostly closed during this time of year. However homestays could be found even during this period. The peak season for tourism in the valley starts from May and goes on till October. The camps are pitched and guest houses open with full staff. Accommodation in Hunder is mostly available in form of guest houses. There are more than 20 garden style guest houses in Hunder offering basic accommodation. Average night stay cost range from INR 300 to INR 1000 in most of these guest houses. Baths in lower range of guest house are shared. Home stays come even cheaper. If you are looking to splurge on some plush air conditioned hotel with fine linen, Hunder is no place for you. The most "luxurious" accommodation are available in 'luxury camps' that could lighten your pocket INR 3000 to INR 5000 for full board bedded tents. Leh is connected by air from major domestic airports of India throughout the year. By road one could travel to Leh via Manali from late May till early October and via Srinagar from May till early November. Once in Leh, the road journey takes 4-6 hours via Khardung La Pass (40 KMs), Khardung Village (34 KMs), Khalsar (23 KMs) and Diskit (19 KMs). More adveturous souls also travel alternatively from Pangong Tso to Nubra Valley and vice versa via Shyok (160km) and via Wari La (236km). However one important point to keep in mind if you are taking this route to travel to Pangong from Nubra Valley is that the closest Petrol pumps are located either in Leh or in Karu. There are no petrol pumps in either Pangong or Nubra Valley. There are only limited restaurants/eating joints available on route to Nubra Valley. Food is mostly provided in the camps or guest houses you'll stay in or in homestays. Only the post paid mobile network works in Ladakh. BSNL and Airtel post paid SIM cards are your best bet to stay connected to the world. Carry enough money as there are no ATMs outside Leh on Leh Nubra Valley route.